Are you looking to enhance your corporate communications and marketing to help you deliver your business strategy? Then here are some of the ways Krishna can support you. If you a marketing, sales, HR, media or communications professional who is looking for assistance in helping educate your internal and external stakeholders in how some of the worlds most successful and innovative companies are becoming social businesses, breaking down communication silos, increasing customer loyalty and bringing products and services to market faster than their competitors then contact Krishna. She delivers one to one and small group executive briefings for your CEO, board and executives informing them of trends in digital technologies and communication and how these can be used to support your organisations goals. What makes Krishna a credible expert to work with your executive team? Prior to establishing her own business, she help a number of board and executive positions in markets across the globe including being a SVP on the board of Guinness PLC then Diageo PLC in Asia Pacific, North America and Ireland. So she understands the unique challenges of exective leaders. If you want to explore social media education, training and mentoring for you as a CEO, senior executive or EXCO member, you can discuss in confidence your personal development programme – schedule a meeting with Krishna to discuss how you can work together. If you are looking for assistance in developing your organisations capability to deliver your strategic goals and ensuring that you have a talent pipeline that will allow you to adapt and change, talk to Krishna about how she can help. As an HR and OD Director, she has led many change management programmes and has developed and implemented talent management processes and support systems including introducing high performance coaching programmes into organisations in Europe, Asia and North America. She is also an authority in training and mentoring, deisgning and delivering training, mentoring and executive coaching programmes to support culture and technology change and the development of new capabilties and workflows for the clients she works with. Krishna has vast experience in leading the internal communications and employee engagment including leading organisations through mergers, acquisitions and disposals. She knows that connecting peoples hearts and minds to the values, vision and goals of the organisations strategy can fundamentally change business performance and the retention of high potential talent. If you want to discover how Krishna can support you with your integrated internal communications and engagment strategy, schedule a meeting with her today. If you are looking for assistance in developing your digital communications strategy to support the delivery of your business strategy, Krishna can support you through social media audits, content marketing audits, working with you to select a digital agency and developing a competency framework for the new skills your people need to succeed on your journey to be a social enterprise. Krishna is often invited to work with organisations who may have been using digital communications for some years but want an independent authority to review their progress and support them taking it to the next level. If you want to discuss how Krishna can assist you in developing your integrated digital strategy contact her today. If you need in-house content marketing and social media training programmes, be assured they are developed in conjunction with your leadership team to ensure that your learning and development needs are fulfilled and we develop our programmes so that new skills are embedded into the organisation after the training programme has taken place. From one to one through to group programmes, Krishna’s clients enjoy being kept informed of the latest trends and best practices to ensure their digital and social media marketing programmes deliver against business goals. As a highly experienced multimedia content marketing expert, you will not just get theory from Krishna. She will share with you the best resources and tools to help you create a compelling and engaging content marketing plan that is relevant for your different stakeholders. All workshops are customised for clients. Increasingly clients prefer the live online learning programmes which provides the flexibility for their teams who are often geographically dispursed and a higher success rate in embedding learning after the training has been completed. This means that Krishna works with clients from across the globe be that Ireland, Italy or Israel. Krishna has worked with HR and marketing professionals to develop and implement programmes where together they have trained and mobilised employees to be able to contribute towards the organisations content marketing plan which has improved the success of the their content marketing and lead generation programmes. If you want to discuss how you too can build internal capability for content marketing please do contact Krishna. Krishna has delivered in-house training to organisations to PR agencies and digital marketing agencies and in sectors including professional services, financial services, technology, energy, telecommunications, public health, pharmaceuticals, higher education, government agencies, FMCG, retail, tourism and leisure and non profits who are at the forefront of social media integration to support them in their journey to becoming a social business. Programmes can be delivered online and with an archive of all materials in our online learning portal for your organisation or in person and can span from half day programmes to week long programmes for example a half day workshop covering tactics to enhance your social emdia marketing, a comprehensive two day introduction to social media, or a five day social business training programme. Programmes are customised and include advanced social technologies education if your organisation has been on a journey to becoming a social business but now need external input to take you to the next level of integration. So whether it is learning about how to use LinkedIn as a publishing platform for employee ambassadors, using live streaming platforms for real time engagement, or video marketing and content creation using your mobile phone, Krishna has over a decade of expertise in delivering digital marketing and social media workshops. Why not discuss with Krishna developing a customised curriculum of workshops for your organisation? If you want to extend the reach of your marketing campaign, you may have considered influencer marketing. Perhaps you are not sure of how to identify relevant influencers? Do you have little experience in developing influencer marketing programmes and are unsure of the guidelines that you need to comply with? For almost ten years Krishna has been educating PR professionals and marketing professionals on influencer marketing best practice and was instumental in the PRII deciding to establish a new set of influence marketing guidelines for their members. Contact Krishna today to explore how influencer marketing can be an integral part of your campaign success. If your organisation has been considering using live video platforms and technologies but are unsure how to get started then you are in the right place. Krishna has been not only educating marketing professionals on how to use these tools, but she uses them herself and since 2015 has hosted a live show all about the latest trends, technology and case studies relating to live streaming and live video or you can get her live streaming tips as a podcast or on Amazon Alexa. Krishna can provide strategic guidance on how to integrate live video into your business and can provide education for your in-house team. She is considered one of the leading experts in live video in Europe supporting media organisations and businesses alike and has provided strategic advice to a number of live video technology platform providers to help them develop tools to enable successful live streaming. Contact Krishna today to ensure you do not miss out on the live stream revolution taking place today. If you are a small yet high potential business who wants to grow their market share or expand internationally, then you are probably going to be investing in digital marketing and digital media communications. Krishna has mentored and trained hundreds of start up businesses since 2005 and makes available her education and mentoring for them through her customised online programmes. All sessions are recorded so that you will be able to revisit the session and apply the learnings to your business. To learn more about Krishna’s mentoring and training programmes for small businesses as the next step, you can book a meeting with her today. Are you hosting a conference and are looking for a key note speaker, a facilitator for a panel discussion or a Master of Ceremonies? 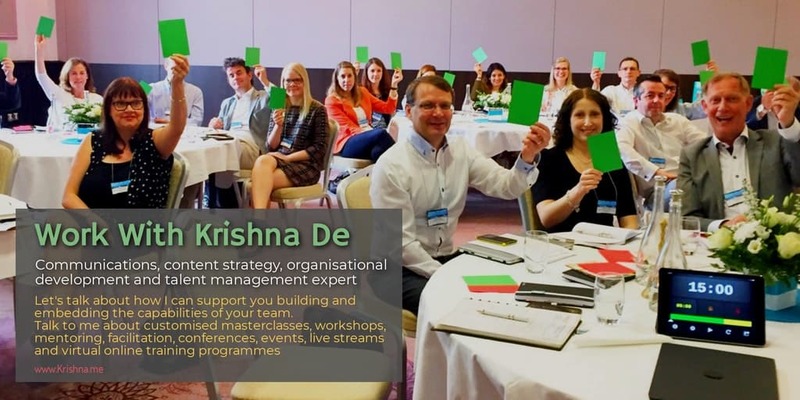 Krishna can help – in fact she often works with her clients to help design the conference or event and even gives them practical marketing advice to help boost their registrations. Find more details here about Krishna’s skills and expertise as a professional speaker covering topics including digital communications trends, social media best practice, managing your online reputation at times of crisis and building visibility through employee advocacy and personal branding. Talk to Krishna today about your forthcoming conference.